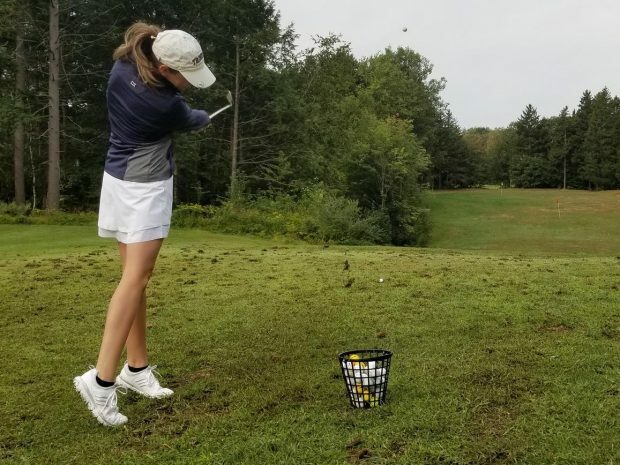 The 2018-2019 school year is going to be exciting for Bantam athletics for many reasons, however, one, in particular, stands out: for the first time in Trinity’s history, a women’s golf team gets to tee it up in NESCAC competition. As Trinity’s 30th varsity athletic program, the women’s golf team launched its inaugural season this past weekend in Maine. Led by coach Brittany Grimm, the Bantams traveled up to Maine to compete in Bowdoin’s Invitational, as well as Bates’ Invitational. Senior co-captain Sarah Vimini (Easton, CT) shot a 78 to finish second-place overall at Brunswick Country Club and Sophomore Gabriela Christensen (Cottage Grove, Minn.) finished 11th overall with a score of 101. In its first-ever competition as a varsity program, the Bantams finished fourth overall, shooting a total of 430. They fell behind first-place finishers Bowdoin, who defended their home turf. On Sunday, the Bantams took a short road trip and continued their efforts at the Bates Invitational. Senior co-captain Sarah Vimini finished third overall with a score of 89, placing just 4 shots shy of second place and another 9 strokes shy of first. Additionally, Bantam sophomore Gabriela Christensen (Cottage Grove, Minn.) finished 13th with a score of 106. As a team, the Bantams placed fourth, establishing the program as yet another strong competitor in NESCAC women’s golf. Trinity College Athletics now has 30 varsity programs, 15 of which are female. Next weekend, the Bantams will take their talents to the Ann S. Batchelder Invitational at Wellesley College to compete. If you see a member of the women’s golf team on campus, wish them luck and offer a congratulations on their inaugural season!